To create a large expo in nine months and grow it to become the premier show for the entire Halloween, costume and party industry. In February 2008, Swift Solutions began discussions with Party Club of America, a buyer group interested in creating a Halloween & Party Expo in Houston. There was an existing national show in Chicago held annually in March. Vendors had expressed an interest to Party Club in participating in a show scheduled in a warmer client at an earlier time the year, preferably in January to give store buyers ample time to order products in time for Halloween. The ultimate goal of the Halloween & Party Expo was to bring Halloween, fantasy costume and party vendors together under one roof, allowing the attending buyers to write up to 100% of their party orders for the year. The Halloween & Party Expo quickly became the number one order-writing show in the industry and the largest global show of its kind. It provided the ultimate comparison-shopping, deal-making and early-buying incentives offered by attending exhibitors highlighting thousands of industry-related products. Attendees flocked to the show from more than 63 countries worldwide to meet and network with industry professionals, attend an array of invaluable educational seminars, and preview the best and newest products. The Halloween & Party Expo offered the best weather and the best timing for on-site sales acquisitions. For six years, the show was held in Houston, which provided a cost-effective location to allow a focus on business with pleasurable weather in the month of January. For 2015, show owners decided to move the event to New Orleans. 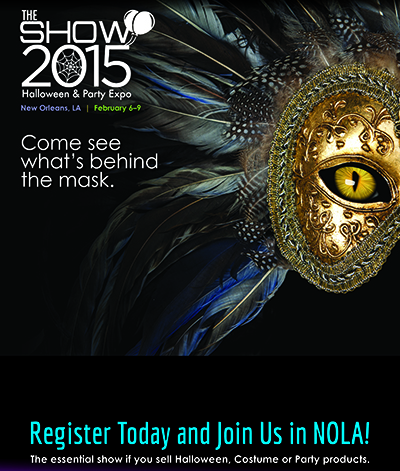 Since the expo is the international showcase for all things party, costume and Halloween related, and New Orleans is one of the world’s top party and costuming cities, the two seemed a perfect match. The Big Easy is famous for its music and food festivals, and—of course— for Mardi Gras, but it is also a city full of people (and vampires, ghosts, pirates, etc.) who love to have fun on any given day of the week. Houston was a wonderful home and birth place for the Halloween & Party Expo, but the organizers and exhibitors felt like New Orleans offered a great change of pace, as a well as a cultural fit for the industry. Swift Solutions managed the following aspects of the show from 2008 - 2015, successfully growing it annually.